Holiday.gr - Argostoli, a trip to a myth! Argostoli is the island’s capital since 1757. It is located in the south part of Kefalonia and it is inhabited since archaic times. In the same location to the current town was built ancient Krini, one of the most powerful towns in ancient Kefalonia. During the 1953 earthquakes, Argostoli suffered a lot of catastrophes. Most of the mansions, imposing buildings, churches and bell towers, were ruined by the strong processions. Argostoli was built from the start. Today it is a modern town, keeping many of its traditional elements, as the new buildings, which were structured according to the Ionian architectonic style. The town is built amphitheatrically with a panoramic view to Koutavos’ lagoon. 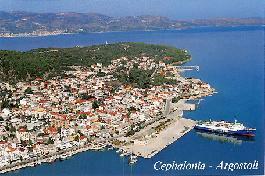 It is the biggest town of the island and the trade and administrative center of Kefalonia. Here is the biggest port in the whole island with the biggest tourist movement. A stroll is not enough to know Argostoli, as the town has many places worth visiting and a beautiful shopping center that will open your appetite for shopping. The heart of the town beats around the central square and between Lithostroto and Siteboron Street with many shops, coffeehouses and bars. It is worth taking a stroll along the coastal road Antonis Tritsis, with pebbles that create beautiful patterns. It is ideal for night walks under the moonlight. In Argostoli you will see some of the most important sites of the island. Kabana square is connected to an important chapter of the island’s history. Kefalonites burnt there Libro d’ Oro, the bible of aristocrats, after the arrival of French in the island. In the same square is also the church of Saint Spyridonas with the famous clock and golden chancel screen. Don’t miss visiting the archaeological museum that hosts remarkable findings from excavations in Korjalenio Library, roofed under a traditional building and has a rare collection of old editions and manuscripts. It is worth visiting the bridge of Devosetos, which connects the town with the other end of Koutavos’ lagoon. It was named after the Swiss military governor De Bosset, who gave the order to make it. At first the bridge was wooden, but later became stony with arches and a sill. It was completed in 1812 and has the sane feature since then. Close to Koutavos’ lagoon are also the remains of the ancient town Krani. You can only see part of the walls, the famous Cyclops walls. You will also see the remains of a Doric temple, dedicated to goddess Dimitra. You can swim in the organized beach of EOT. In close distance are the beaches of Platis, Makris Gialos, Gradakia and Kamaroules. 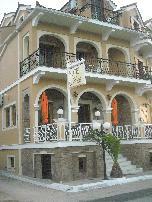 The cosmopolitan Argostoli is ideal for staying. Here you will find hotels of all categories and complexes of rooms to let. Nightlife is high and satisfies all tastes. Holidays in Argostoli will be unforgettable. Been to Argostoli ? Share your experiences!